The 2019 Toyota Highlander is a 8 passenger Automatic transmission, 2 Wheel Drive Sport Utility Vehicles or 4x4 Sport Utility Vehicles. It is available in 10 trim packages, the Hybrid LE, Hybrid Limited, Hybrid Limited Platinum, Hybrid XLE, LE, LE Plus, Limited, Limited Platinum, SE, and XLE. The new Toyota Highlander invoice price ranges from $28,787 to $44,582, while MSRP ranges from $31,530 to $48,830. 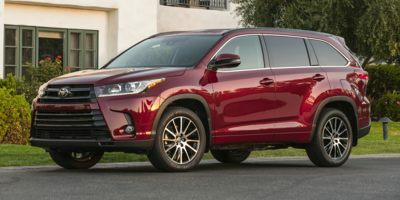 The 2019 Toyota Highlander is available in 9 exterior colors, Alumina Jade Metallic, Blizzard Pearl, Celestial Silver Metallic, Midnight Black Metallic, Ooh La La Rouge Mica, Predawn Gray Mica, Salsa Red Pearl, Shoreline Blue Pearl, and Toasted Walnut Pearl, and 4 interior colors, Almond, Ash, Black, and Saddle Tan.